JOHANNESBURG –KAIZER Chiefs and Orlando Pirates have shared the spoils after a one-all draw in an Absa Premiership Soweto Derby played at the FNB Stadium on Saturday. Kickoff was delayed by ten minutes to accommodate throngs of supporters still outside the stadium at 15h30. Interestingly, Chiefs hardman started from the bench, error-prone Wayne Sandilands was back in the Pirates goal and January signing, Nigerian Daniel Akpeyi, was in goal for the home team. Chiefs showed their intent in the third minute when Zimbabwean star Khama Billiat stung the palms of Sandilands with a shot from inside the 18-yards for the game’s first corner kick. Pirates responded in the 11th minute but Xola Mlambo blasted wide from the edge of the area with Chiefs defence panicking. Chiefs pressed more than their opponents and nearly got breakthrough with a succession of chances-veteran Bernard Parker’s shot from outside the box saved by Sandilands and Billiat’s bicycle effort from the rebound sailing over as the first stanza wore on. Uncharacteristically, Pirates finished the half without a shot on target. They would pay the penalty in the 53rd minute as defender Daniel Cardoso converted from the spot after a clumsy challenge on Billiat by Asavela Mbekile. The rampaging Billiat returned to haunt Pirates moments later but shot narrowly wide and forced a save from Sandilands both in the 57th minute. Alfred Ndengane was lucky to receive only a yellow card in the 67th minute for a professional foul on the speedy Zimbabwean star. Akpeyi–his first save in the game. 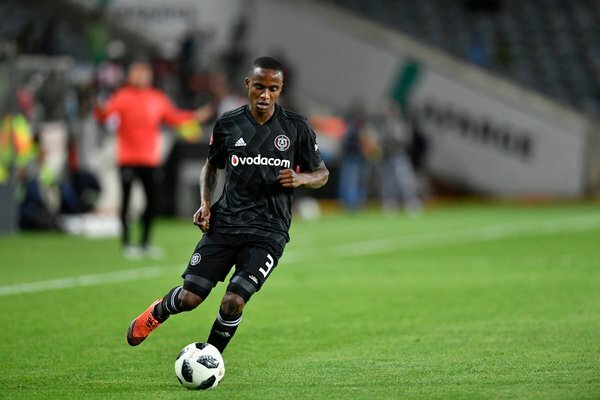 The big Nigerian was eventually beaten when Thembinkosi Lorch beat the offside trap to round of the goalkeeper and slot into an empty net in the 80th minute. The result kept intact Pirates’ unbeaten record, dating back to over four years ago, against their Soweto rivals. Kaizer Chiefs: Akpeyi, Moleko, Ntiya-Ntiya, Hadebe, Cardoso- , Maluleka, Ekstein, Parker(C), Mashiane (Zulu 46’)- , Billiat, Castro (Katsande’). Subs: Bvuma, Katsande, Mphahlele, Zulu, Ngezana, Paez, Ntshangase. Orlando Pirates: Sandilands, Mbekile, Maela, Ndengane, Jele (C)- , Motshwari, Lorch, Mlambo, Nyatama (Mulenga 61’)- , Shonga, Pule. Subs: Mabokgwane, Munetsi, Mako, Mntambo, Makola, Mahachi, Mulenga.